The Komori Ninja are back! I'm turning in the story/art for UY 155 tomorrow. Inspector Ishida is back in the 3-part Secret of the Hell Screen. You just made my year, Stan! I was thinking about this issue today (and the Komori ninja in general), and I had the thought that you could make a pretty cool custom Komori ninja action figure using the BTAS Man-Bat figure. Then that got me thinking about UY custom figures, and I found this super-cool one on the internet: Toyark. I read this over the weekend, and really enjoyed it. 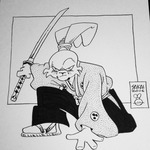 I hadn't read much Usagi Yojimbo in the past few months, and I hadn't realized how much I missed it. It was neat to see the samurai from #149 again. I was wondering when he would show up. I also really enjoyed this issue! I love the Komori ninja and really enjoyed the new female character. It seemed to me that the cover paper and the interior page paper was of a much higher quality. Usually I can see the bleed through from cover to interior cover page and this month I could not. It also seemed more glossy. The interior pages felt thicker for sure. If that is true I wonder what prompted the change and if it is something Stan requested, readers requested or if Darkhorse decided it was time to improve on quality??? Whatever it was, I noticed and it was appreciated especially since they didn't change the price. I noticed the new paper too. I wonder why the change was made.